Disclaimer: Talk to your doctor or healthcare provider before undertaking any therapeutic intervention. I’m simply laying out the science, not prescribing anything to you. Besides, I just met ya’ll. In my last blog I went over some really compelling research identifying a key link between adrenal fatigue, SIBO/IBS, and IBD. That key link ,the inflammasome, is a powerful regulator of inflammation in the body. The NLRP6 inflammasome does all of these things when activated but fails to follow through when deactivated. Key to understanding how this works lies within a paper you can find here. This study went about looking for the ways the inflammasome is regulated in the gut. The next step was to identify which bacterial metabolites in the gut activated or deactivated the inflammasome. Check. The final step was to experiment with these metabolites and see if they caused any changes in the gut. Check. And they were very robust changes. Before we dig in to the specifics, I want to point out that all you need to do is dig in to the research and you’ll find that these metabolites are not just important for bacteria. These metabolites also just so happen to have highly significant relevance to human health. I’ll connect the dots for you, but just know that these findings may revolutionize the way we look at the connection between gut health and autoinflammation/autoimmunity. In fact, histamine has so many roles throughout the body that there isn’t a tissue that doesn’t express receptors for it. In layman’s terms, bacteria are hijacking the signaling in your gut to gain an ecological foothold there. The result is a heavily damaged gut that leads to dysbiosis, inflammation, altered motility, and autoinflammatory effects throughout the body. Of equal importance is making sure your diet is nutritionally adequate. I hope to create a program that hits on all of these things in the near future, but for now you can head on over to the low histamine chef here and get some great food ideas. Remember in my last blog where I discussed the HPA axis and how people with adrenal fatigue have elevated corticotropin-releasing hormone levels(CRH)? Well, that comes in to play here, big time. Mast cells are cells that contain histamine and other inflammatory mediators. Mast cells also contain receptors for CRH. When CRH binds to mast cells, it causes them to release histamine along with a host of other inflammatory molecules(2, 3). This may be the mechanism connecting adrenal fatigue with gut disorders. Disruption of this signal may be the first step you take to begin correcting your gut problem. Of course, it’s a great idea to work on managing stress appropriately while using a low histamine diet to regain proper gut signaling. Now that we’ve identified how we can inhibit the inflammasome, let’s take a look at how we can activate it. The other inflammasome signal is interesting in a couple of ways. It has a wide range of functions throughout the body, not just the gut. It’s also something that has a very interesting evolutionary story. I’m talking about taurine. Taurine is an amino acid found in every animal, most of which can synthesize it on their own. A notable exception is the cat which requires taurine from their diet. Pottenger’s cat studies illustrate this point nicely. Probably the most interesting thing about taurine has nothing to with the above. Taurine is interesting because you conjugate bile acids with it. Conjugation of bile acids with taurine makes them water soluble so they stay in the gut. As taurine makes its journey through your gut and in to your colon, bacteria pull the taurine off: an act called deconjugation(7). This is where taurine is made available to the inflammasome and why the microbiome is important. Taurine has a very interesting place in biology when it comes to bile acids. Animals conjugate bile acids with either taurine or glycine. Most carnivores conjugate their bile acids with taurine while most herbivores conjugate their bile acids with glycine. The notable exception is ruminants(Cows, goats, etc) who conjugate their bile acids exclusively with taurine(8). In general, omnivores tend to form mixed conjugates depending on their diet. In omnivores, the extent to which bile acids are conjugated with taurine or glycine is dependent on the amount of taurine in the diet. More taurine means more taurine-conjugated bile acids. Glycine intake has no effect on which conjugation method is used(9). It’s believed that increased taurine intake causes increased bile acid output. This is because ingesting taurine increases the amount of taurine-conjugated bile acids but has no effect on glycine-conjugated bile acids. The net result is greater total bile acids(9). Another taurine fun fact is that it’s only found in foods from animal origins, plants don’t contain it. This makes sense given the carnivore/herbivore divide. Ruminants are an exception because they make a lot of taurine endogenously: they don’t need to get it from their diet. But it creates developmental problems for children in vegan communities who likely don’t get enough through their diet(4). It makes perfect sense that carnivores would conjugate their bile acids with taurine given its characteristics. Taurine makes bile acids more soluble at physiological pH and should be more effective at emulsifying fats than glycine conjugates(8). Obviously a carnivorous diet should contain far more fat than an herbivorous one. With regard to the inflammasome, taurine activates the inflammasome and upregulates the processes associated with it(10). This includes a reduction of auto-inflammation, increased antimicrobial peptide secretion, and a more health promoting microbiome. Activation of the inflammasome by taurine also reverses the problems associated with increased histamine load. Conversely, higher histamine load blocks some of the effects of taurine. But the fun doesn’t stop there. I’m a big fan of nutrients that give you tons of bang for your buck, and taurine is definitely one of those nutrients. I’m just gonna put these in list format to save time. All of this stuff is great news for people with SIBO, IBS, IBD, and even histamine intolerance. The best part about the taurine side of things is that as a component of bile, it participates in the enterohepatic circulation. This means it cycles through the gut 7-10 times every day provided you’re getting enough of it. There you have it and here’s the recap. Histamine functions as a negative regulator of the inflammasome which creates an environment that leads to dysbiosis. The dysbiotic gut promotes the existence of histamine generating bacteria than can hijack signaling and deactivate the inflammasome. Could this potentially be the cause of histamine intolerance? Could it also be the cause of SIBO? Lactobacillus, a commensal species, are often a cause of SIBO. They also happen to make histamine. Stress can also play a role here. High levels of CRH induced by stress destabilize mast cells and cause the secretion of histamine. This again inhibits the inflammasome. A low histamine diet is appropriate here but it’s likely not enough to restore proper signaling to activate the inflammasome. You need more ammo. Taurine, on the other hand, functions as a positive regulator of the inflammasome. 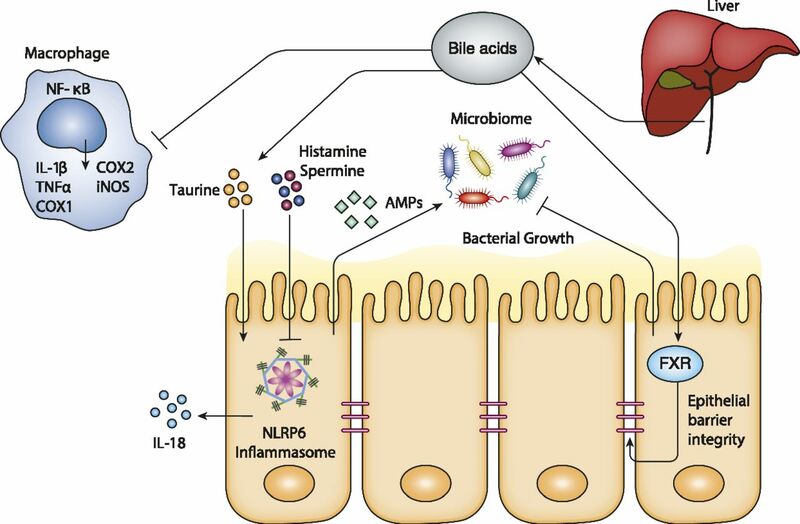 The deconjugation of taurine conjugated bile acids by bacteria liberates taurine which activates the inflammasome and promotes a healthy gut. Could a low histamine diet and taurine intake turn the tides on dysbiosis? Could this approach cure SIBO, IBS, IBD, or histamine intolerance? The honest answer is we have no idea, but has anyone tried? There’s certainly enough science out there to justify trying. Adrenal fatigue, SIBO and IBS: A common link and possible cure? Is there possibly another option for those of us who are unable to tolerate taurine? Nothing that will work like taurine based on the results of the study I discussed. What are your symptoms with taking taurine and is it a general sulfur issue? hello , great article. I want to try taurine but i have bad reaction on sulphur. Msm, Nac, onion, garlic and more. Yeah, I’ve heard people who have issues with sulphur sometimes respond poorly to taurine. My genetics test suggested I should not take taurine! I do respond badly to some sulphur foods like garlic. I have had disordered liver enzymes after cholecystectomy, gastritis and sibo etc. B1 ( benfotiamine ) 100 mg and a small amount of molybdenum will fix you right up.